Have you always dreamed of managing a restaurant? Now you can, in a brand new business simulator Coffee Shop! Set off to a quiet country town to help Tatiana open a restaurant and cheer up her customers with the aroma of fresh coffee day after day. Dive into restaurant story and open your own coffeeshop! Build your own cafe at any time of your choosing! Buy equipment, hire staff and increase your service level. Don’t forget about the interior design: beautiful and comfortable furniture, pictures on the walls, vases with gentle flowers on tables… Comfort is in the details! Enjoy simulation of the real cafe to get unique experience. Make the best coffee in the city – do everything you can to capture the hearts of even the most discerning clients and make as much money as possible! 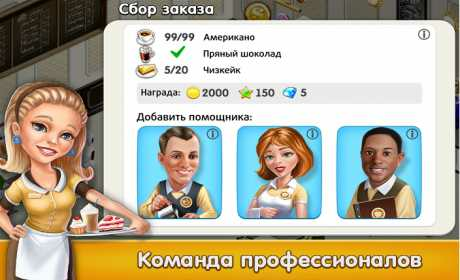 The game business simulator: Coffee Shop will turn you into the best coffee maker! 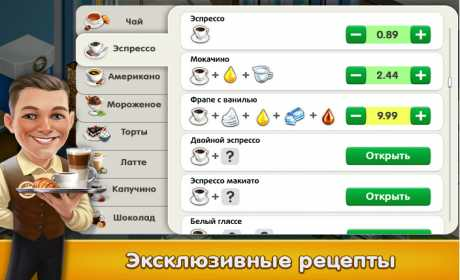 • Make all kinds of coffee in business simulator: americano with chocolate, espresso con panna, cappuccino… Mmmm! • Decorate your coffee shop business simulator with a charming interior design: put flowers on the table and choose pleasant lighting. Your customers won’t take the comfort for granted! • Change your cafe’s style: buy and improve furniture – simulation of the cafe will teach you to think about all the details. • Purchase new equipment! This will help you provide a faster and better service to your customers. • Think about your cafe’s design and don’t be afraid to upgrade its interior in game simulation. Your customers love beauty and comfort, and they show their gratitude in tips! • Thanks to this simulation your opportunities are endless! Enjoy managing a cafe and expand it to gradually increase your customer base! Enjoy the business-running simulation of the real cafe! Make it possible to say proudly “My Coffee Shop is the best!” Write your exciting restaurant story! Dear friends, the game business simulator: Coffee Shop is currently in beta. Like our idea of cafe simulator and can’t wait for the full version? Then please leave your reviews and comments or send your recommendations and suggestions for the game to support@melesta-games.com. Let’s make the restaurant of your dreams TOGETHER!